DETROIT (ChurchMilitant.com) - A new survey reveals Europe is now comprised largely of non-practicing Christians, who cite religious beliefs, nationalism and social issues as the reason for leaving their faith. The Pew Research Center poll published Tuesday shows that, across 15 Western European countries, most still identify as Christians, despite the fact that few attend religious services at least once a month. A median of 91 percent were baptized, 81 percent were raised Christian and 71 percent are currently Christian, while only 22 percent regularly attend church. 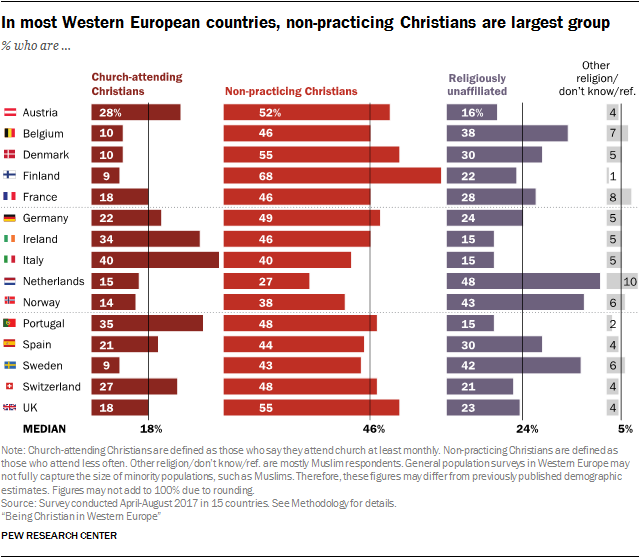 In most Western European countries, non-practicing Christians are the largest segment of the population, even though this group attends church services a few times a year. In Denmark and the United Kingdom, 55 percent of the total population are non-practicing Christians, while that figure climbs to 68 percent in Finland. On the lower end, 38 percent of the population are non-practicing Christians in Norway and 27 percent in the Netherlands. This doesn't take into account those who identify as religiously unaffiliated in either country, which is over 40 percent in both Norway and the Netherlands. 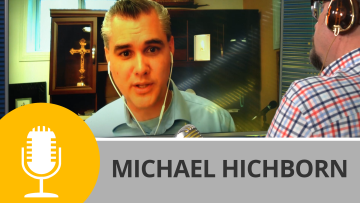 The survey also reveals non-practicing Christians often outnumber those who identify as atheist, agnostic or "nothing in particular" ("nones"). This sample size of almost 12,000 non-practicing Christians finds that they still constitute a majority of the population despite the surge in immigration from the Middle East and North Africa. Non-practicing Christians make up more of the population than all other religions combined (Muslims, Jews, Hindus, Buddhists, etc.). But the religious, political and cultural views of non-practicing Christians contrast with those of their practicing counterparts. Most non-practicing Christians (51%) believe there is another higher power or spiritual force other than God as described in the Bible, as opposed to 32 percent of Church-attending Christians. Non-practicing Christians make up more of the population than all other religions combined (Muslims, Jews, Hindus, Buddhists, etc.). Among non-practicing Christians, only 35 percent think the government should support religious values and beliefs, contrasted with 58 percent of their practicing counterparts. Forty-five percent of non-practicing Christians and 49 percent of Church-attending Christians believe Islam is incompatible with their national culture and values. This aligns with their strong nationalist views across the board. A majority of both non-practicing and practicing Christians, 48 and 54 percent respectively, say they completely or mostly agree that "our people are not perfect, but our culture is superior to others." And with regard to social issues, 85 percent of non-practicing Christians support the legalization of abortion in all or some cases and 80 percent favor the decriminalization of gay "marriage." A majority of Church-attending Christians tend to be more conservative and in agreement with the official biblical teaching that marriage is only between a man and a woman (81%) and abortion is the murder of an unborn child (75%). Another Pew Research poll from last year projected the stagnation of Christianity in the coming decades. Despite low fertility rates, low conversion to Christianity and a steady increase of non-affiliation among Millennials, Christianity is slated to make up only 65 percent of Europe's population in 2050. And Islam is expected to almost double in Europe, moving from 6 percent of the population in 2010 to 10 percent in 2050.